Amboseli National Park is the second most popular park of Kenya (after the Masai Mara National Reserve) as it lies in the shadows of the mighty Mount Kilimanjaro, the highest mountain in Africa, it’s closeness to Nairobi (160 miles or 260 kilometres south of the city) and the good opportunities for wildlife viewing. This makes it very touristy. 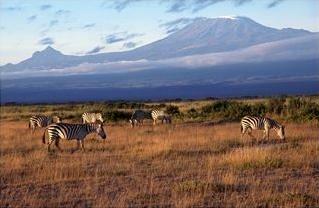 The Kilimanjaro peak is present on the horizon in large parts of the park, although clouds often cover it in mystery. When clouds are gone, the view is simply stunning. Sunrise and sunset are the best moments to view the mountain, and two lodges in the park centre offer superb opportunities to do so. Within the park is a temporary lake (Lake Amboseli)w which occupies a large swath of the park and that floods during years of heavy rainfall. A large part of the park consists of open plains. This makes wildlife spotting much easier. Besides open plains, the habitats consist of rocky thorn bush country, acacia woodland, marshland and swamps. The park has lots of water, coming among others from the Kilimanjaro and from extremely heavy rainfall in 1992-93 and 1997-98. This has, quite recently, led to large swamps which in turn attract much animals and birds. In the past, tourist vans have done their bit of damage to the park. The unpaved roads can be very dusty, even when driving slow. However, very strict government policies (including fines and expulsion for off-road driving) have already repaired much damage done in the 1980s. The Observation Hill allows an overall view over the whole park, especially the elephants and swamps. The park is elephant country par excellence. You’ll encounter whole herds of elephants with exceptionally large tusks, and they are sometimes surprisingly relaxed around tourist vehicles. But many large animals can be spotted here: buffaloes, leopards, zebras, giraffes, gazelles, etc. Hippos can be seen bathing in the many water and swamp channels. The lion population has been small for a long time, the result of lion killing by Masai as a revenge for several government policies that were detrimental to them, but there are some signs that the population is growing again. Apart from game drives, it’s possible to visit Masai villages inside the park against payment. You’ll do things like drinking tea with the village elders and the warriors, watch traditional dancing and, take pictures and, of course, buy some souvenirs. The park has some excellent lodges and campsites, though prices in some of them are sky-high. Tortillis Camp has excellent views on the Kilimanjaro, but singles/doubles are $522/$870 in the high season (10% discount in the low season). Family tents go for around $1740 while private houses go for $2175. The other lodges: Amboseli Lodge for singles/doubles are $284/386, Ol Tukai Lodge for singles/doubles $350/450. Amboseli Serena Lodge ranges between $ 285/386. All can be recommended for their terrific views and good atmosphere. It’s possible to only have lunch there too. KWS also runs a fenced campsite at the border of the park, so you can walk around safely at night. Camping is $10 for adults and $2 for children per night. 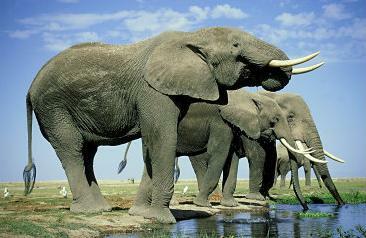 The park is located 160 miles (260 kilometres) south of Nairobi. It has 3 airstrips for small aircraft. There are four gates. On the Western side, the Kitirua and Meshanani gates are in poor conditions and Kimana (Southeast) are relatively in good conditions. During the rainy seasons, a number of roads are not accessible. Entry fees for non-Kenyans are $80 for adults, $40 for children.